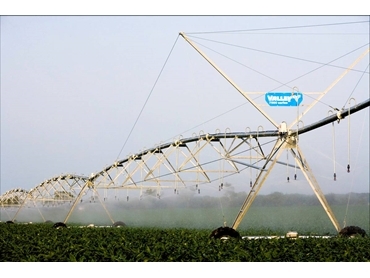 The AutoPilot linear with GPS control panel from Valley Irrigation recently won the Irrigation Association’s prestigious agricultural New Product Contest. The AutoPilot linear control panel is the first computerized control panel with GPS Ready technology providing positioning for linear irrigation. The panel itself was introduced in the international marketplace in the summer of 2007 and became available in North America in early 2008. GPS Ready technology recently became a standard component of all new AutoPilot linear control panels. “We’re honored that the AutoPilot linear control panel was recognized by the Irrigation Association,” said Jake LaRue, manager of international projects and products, Valmont . The AutoPilot linear control panel with GPS Ready positioning is unique because it allows linear irrigators to correlate production techniques with land variability, ultimately minimizing costs and maximizing yields, LaRue said. “With GPS technology, a producer can set more automated functions to change the percent timer speed, control primary and secondary end guns, change direction, stop the linear, and start and stop chemigation,” LaRue said. The Irrigation Association New Product Contest was introduced in 2002 and has since become a mainstay of the annual Irrigation Association show. “Products have to go through a qualifying screening process before they can even be considered for the top award, so it’s not an easy award to win,” said Kathy Bradley, Irrigation Association meetings coordinator. The winner of the New Product Contest is determined by judging criteria that include the product’s ease of use, quality of design and product life expectancy. Other considerations include how the product contributes to water conservation, cost savings and time savings.